678 pages | 11 B/W Illus. 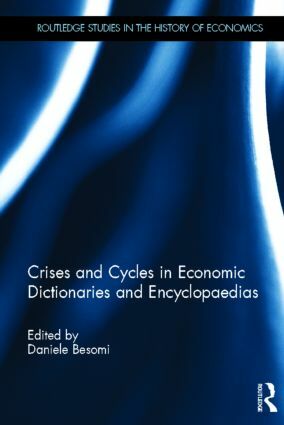 This book investigates from the perspective of the major economic dictionaries the notions of economic crisis and cycles. It gives an extensive summary of a number of significant entries on this subject, with an introductory essay to each entry placing them (and the dictionary to which they belong) in their context, giving some details on the author of the dictionary entry, and assessing the entry’s (and its author’s) contribution. The broad picture (including the history of these encyclopedic tools) is examined in the introductory essays. Daniele Besomi is an independent researcher in the history of economic thought and a research fellow of the Centre d'Études Interdisciplinaires Walras Pareto, University of Lausanne, Switzerland.